Perhaps you saw my post yesterday about what a gift build REALLY looks like behind-the-scenes. If you did, you now know how messy it is. It takes quite a bit of chaos to get to the end result which is a gorgeous set of welcome gifts. We are bursting at the seams around here! When you're a small business and it's only been 6 months since the launch of your website, bursting at the seams is a good thing. BUT. When your business is literally taking over your home, it becomes time to seriously consider a studio space. I'm not ready to commit to a commercial space and all that's involved with that. So, I have cleared out a rather large self-contained room in our basement and have begun plans for a REAL studio. Because the nature of my business requires me to hold various amounts of inventory, the studio space must involve industrial strength shelving. Much like a warehouse space. Bleh. How boring is that? But, since it will also be a work space for employees and myself, I want it to be pretty and feel incredibly inspiring. So. Yesterday, I took a break from gift design and decided to see what kind of interior design I could put together for my space. And, of course, on the smallest budget possible since my goal is to put all revenue from the business immediately back into the business. Feeling incredibly thankful for lucking out at some of my all-time favorite go-to places! 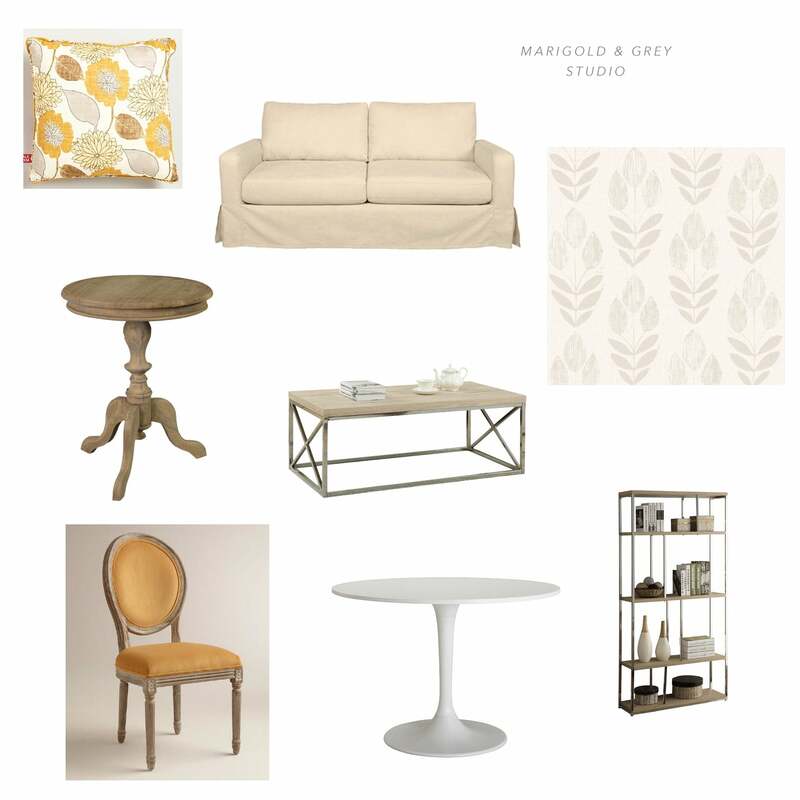 Because of Joss & Main, World Market and even Ikea, I can outfit my studio for an amount that's relatively guilt-free. I mean, this coffee table...less than $200! I'm about to pull the trigger today and, yes, even on the wallpaper! P.s...me installing wallpaper for the first time will require an entirely separate blog all its own. Make sure to keep following along on the blog and Instagram for even more behind the scenes peeks!